The world’s largest underwater theme park will have a submerged Boeing 747. Details of the new project were revealed by the Personal Representative of His Majesty King Hamad and president of the Supreme Council for Environment, Shaikh Abdullah bin Hamad Al Khalifa, said a report in BNA. 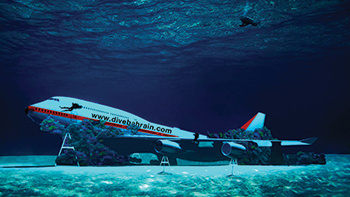 Covering an area of over 100,000 sq m, the exceptional dive experience will include several structures such as a submerged 70-m Boeing 747 as a centrepiece, as well as a replica of a traditional Bahraini pearl merchant’s house and artificial coral reefs. The sculptures will be fabricated from eco-friendly materials and submerged to provide a safe haven for coral reef growth and a habitat for marine life, the report said. Scheduled to launch in the coming months, the underwater dive site is an eco-friendly project undertaken by the Bahrain Tourism and Exhibitions Authority (BTEA) in partnership with the Supreme Council for Environment and the private sector. The diving site is set to be open before the summer of 2019, the report said.